Last week I ran to the grocery store to quickly pick up a few things for dinner since we had a guest coming. 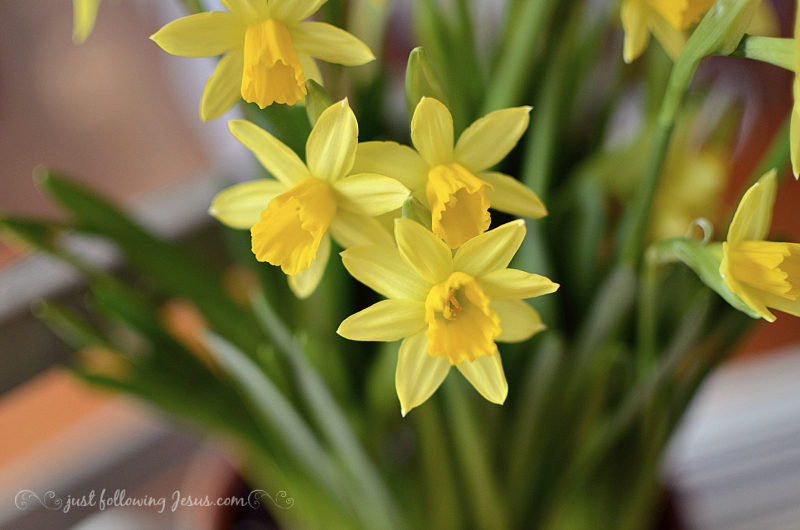 When I saw pots of daffodils on sale for only $3.99 I knew I couldn't lose. and I had an instant centerpiece fit for company. 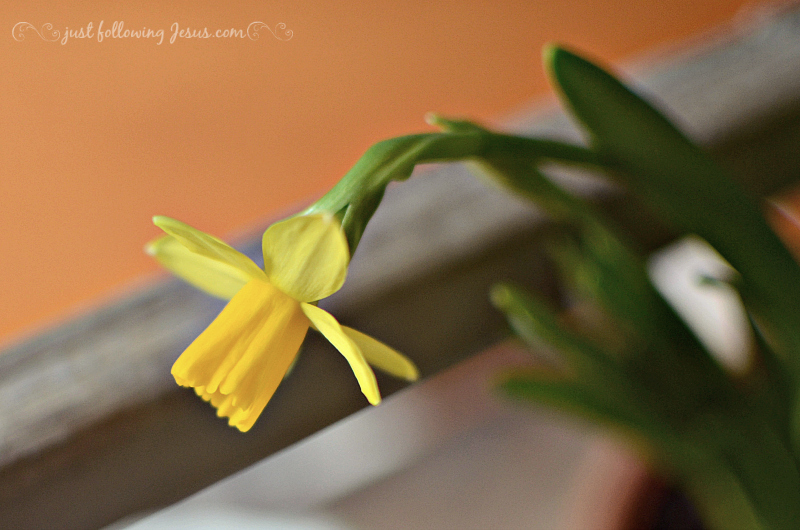 When they're done blooming, I can plant the bulbs outside! and a thrift store ceramic container with a little bird perched on top. 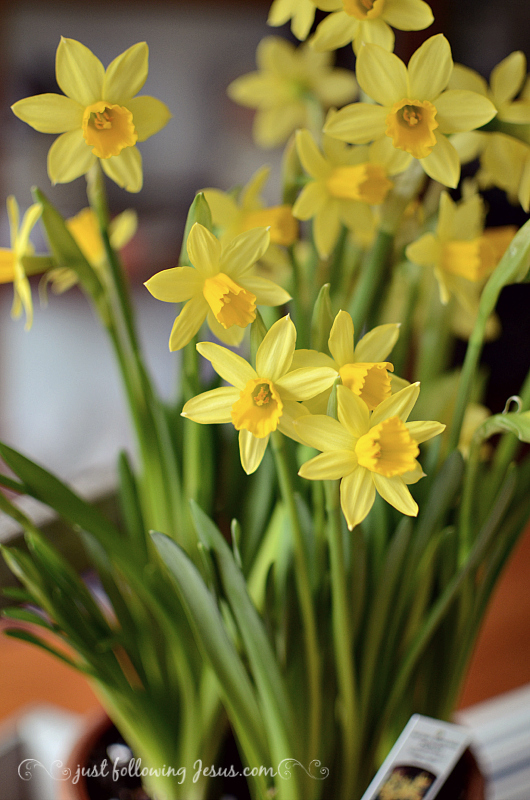 Is there anything that says spring more than daffodils? So, so pretty! 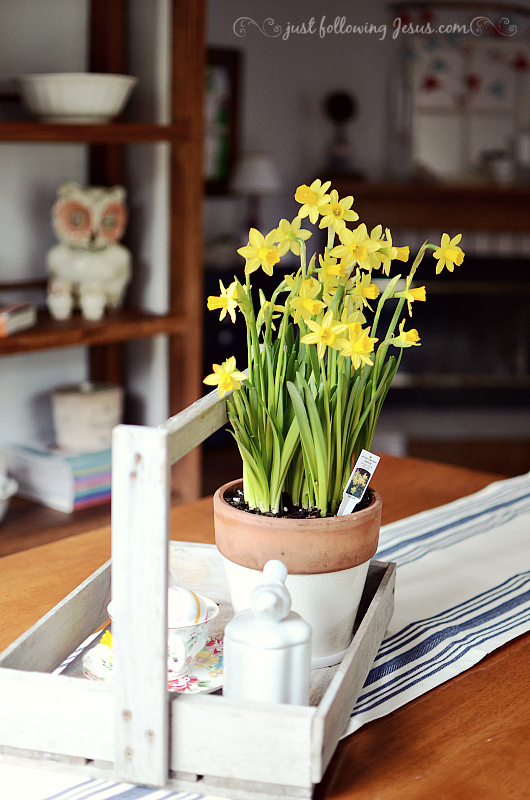 Love the way the daffodils add so much cheeriness inside. Thanks so much, Mary Alice! I noticed today that the lilacs are starting to bloom! Good Evening Elizabeth, I love seeing the first flush of snowdrops, because I know that following hot on their heels will be daffodils. 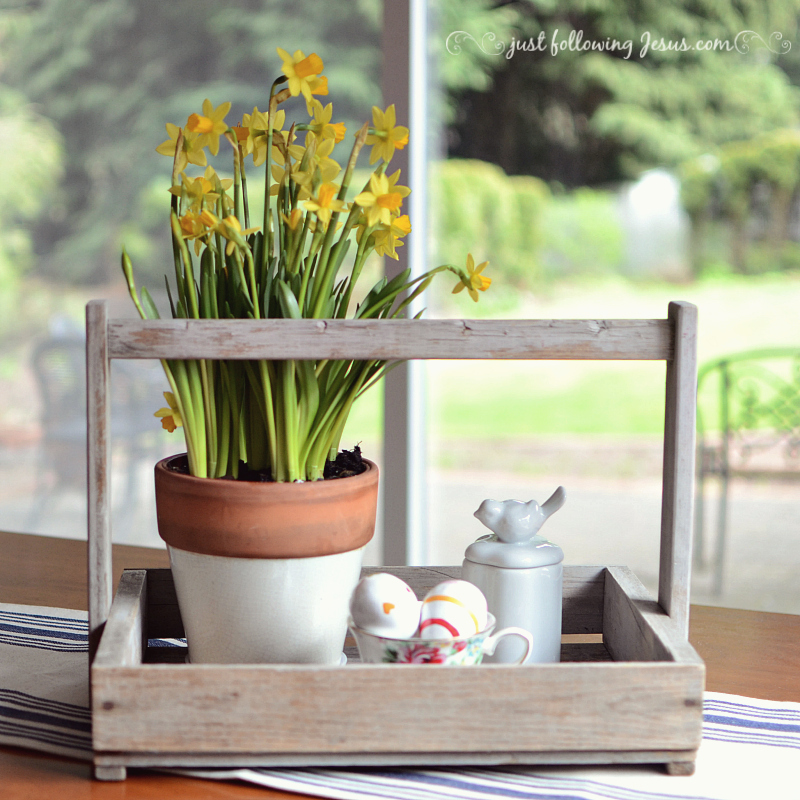 I do exactly the same as you do, I buy daffodils in pots to enjoy in my home and then I plant them in the garden. I then have the best of both worlds. Our home is small and simple but we are so grateful for what God has given us. 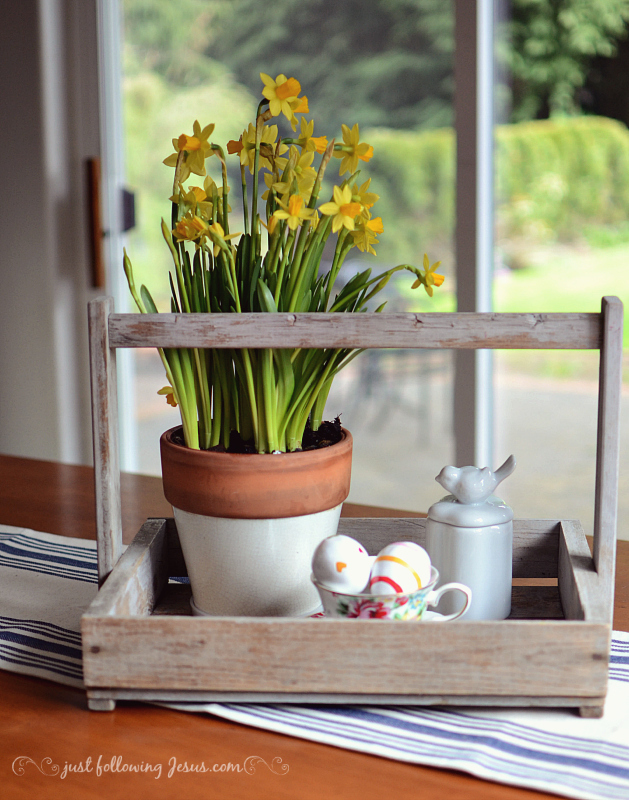 Treat yourself to some flowers with your hubby gone, it will lift your spirits. Love to you, Beth! How pretty. 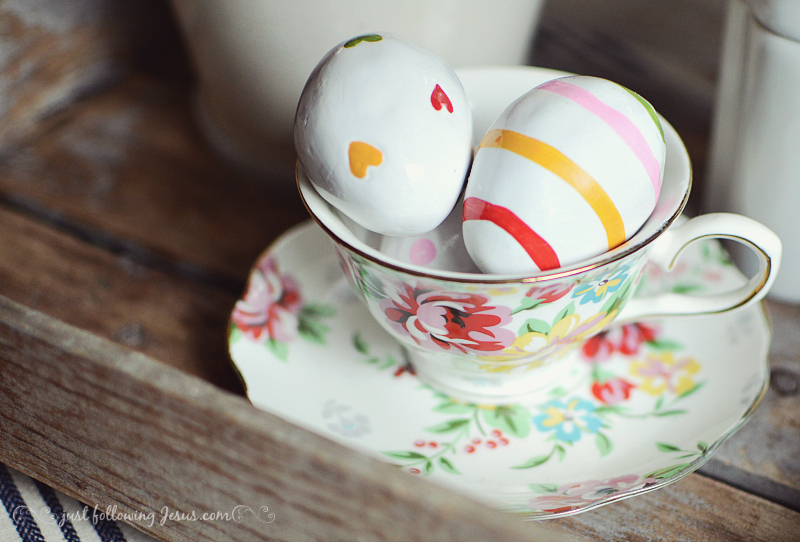 I love your pretty little tea cup with the eggs in it too. Thank you, Stacy! 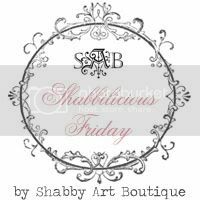 It's one of my favorites as well! 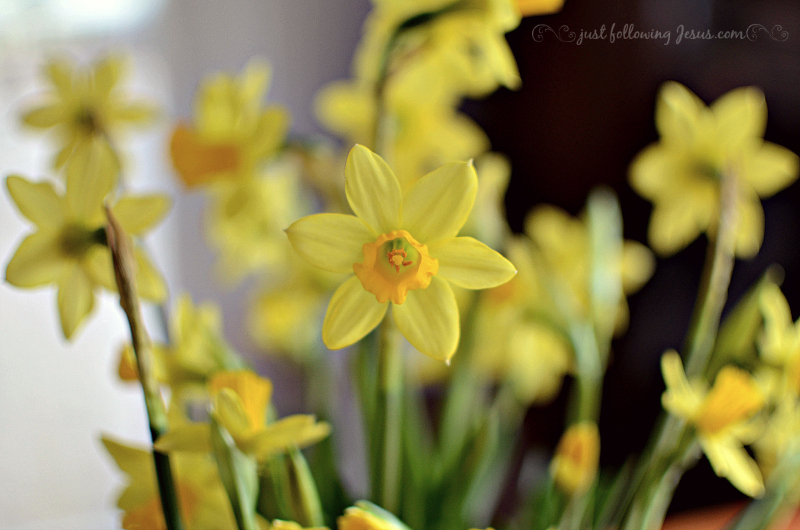 Daffodils are the cheeriest of flowers! 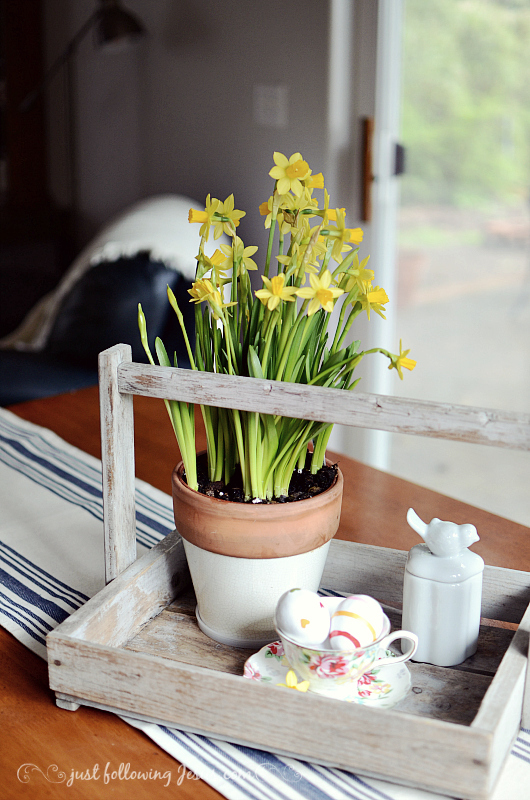 I love your sweet spring vignette! Thank you so much, Jacqueline! I was thinking that you would have added some beautiful linens to the centerpiece. 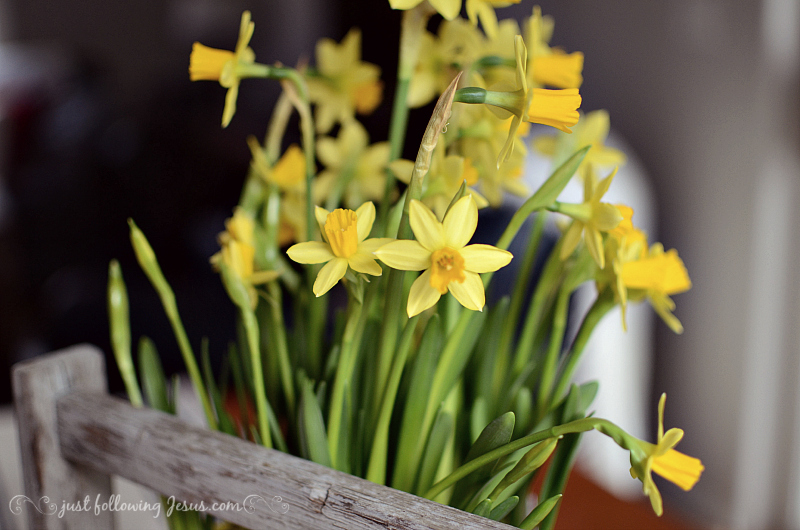 I always love your centerpieces - but you KNOW I love your daffodils! 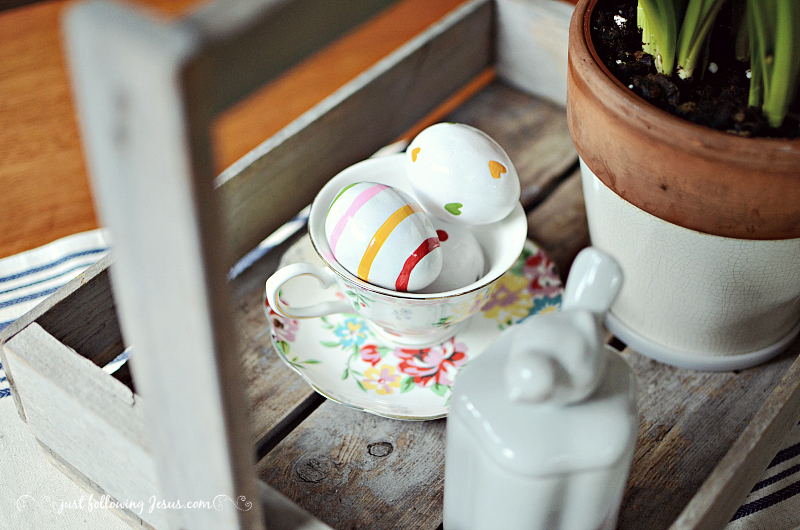 The little, wooden eggs are cute and it all says Spring. And welcome! 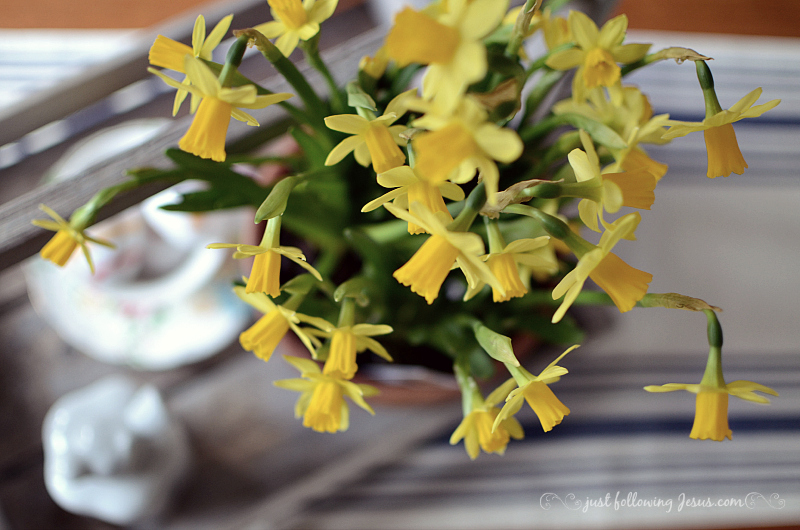 I knew you'd love the daffodils! 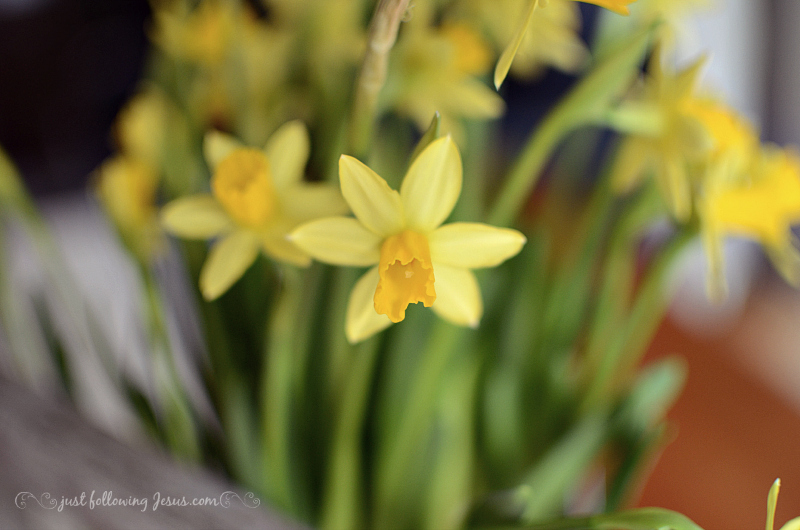 Wonderful decorations and gorgeous narcissus, one of my favourites flowers! Thank you so much, Ana, for stopping by and taking the time to comment!